A billboard for Wodka vodka in NYC has been taken down and destroyed after complaints that the advertisement's message is anti-Semitic. 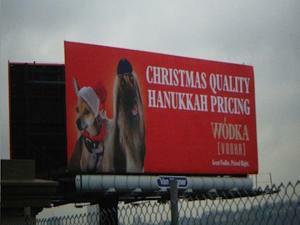 The New York Times reported that the billboard featured a long-haired dog wearing a yarmulke and another dog wearing a Santa hat with the words, "Christmas quality, Hanukkah pricing," alongside the photo. The backlash against the billboard was nearly instantaneous. Ron Meier, regional director of the Anti-Defamation League, called it "crude and offensive." "To use the Jewish holiday in dealing with issues of money is clearly insensitive and inappropriate," Meier told the paper. Brian Gordon, head of MMG, the advertising company behind the billboard, said the billboard's message was not intended to be offensive. "We thought people would perceive it as 'ha ha quirky.' But people perceived it as offensive, and because of that, we pulled it." Mr. Gordon, according to the Times, was "quick to point out" that he also is Jewish. "Although rarely serious, we apologize to anyone we may have offended through our holiday campaign and are removing our billboard immediately." [O]n the company Twitter you can find a picture of the "Jewish" dog posing with Jonathan Cheban in a different ad. There's also this sheep wearing a sombrero standing near a Wodka bottle, and a "black Russian"—a black man wearing one of those fuzzy Russian hats.